Background: I love Gauntlet, this is a certainty. My love is very narrowly focused; I adore the masterpiece Gauntlet Legends for N64 and tolerated the worse off sequel Dark Legacy on Gamecube. Gauntlet 1 and 2 are very boring and do nothing for me. Thus, I welcomed myself to the pain I knew I would experience with the GBA version of “Dark Legacy”. Story: There always is a simple story for Gauntlet. Sumner, not to be confused with the season summer, is a yellow colored mage who lives in a castle. The “EVIL MAGE” Garm, Sumner’s younger brother decides he wants to play with some advanced magic from the Runestones, summons Skorne, some hellfire demon. Skorne, proving to be “too strong” for Garm to handle, decides to kill Garm and “scatters” the Runestones through the realms so he can’t be challenged. Now, take all this information you just learned and omit it from the GBA version. The game starts without a cutscene and a few lines of text detailing none of the above. “Step forward minion. Many have travelled (sic) this path you follow. All have failed. Your desire to face the forces of darkness will prove your undoing. You must face Garm’s evil forces in each of the five realms. Return them to their underworld and you will earn the respect of the entire world. Fail and …….. Come to me now and I will tell you more about your quest. Gameplay and Sound: To sum it up in one word, this is Gauntlet, version .05. The developers of the game have the basic scenario down: kill enemies, kill enemy generator, collect loot, level up, ect., but completely fail in execution. By game, I refer to the first level which took forever to beat, was very boring, and only 8 creatures could spawn at once on screen EVER. This means that I could let ~8 enemies spawn, let them chase me, and then just walk to the exit. Gauntlet is about huge number of enemies onscreen. I understand the GBA is less powerful, but SNES games could put tons of sprites on screen at once, Gauntlet’s ugly isometric enemies aren’t pushing any limits. When I mean walk, I mean walk. I was using the archer, which is the fastest character, and it took at least 20 minutes to beat the first level. A glaring omission comes from the lack of the turbo system. This is the positive reinforcement that makes trudging through the hordes of enemies worth it. You know that in a certain amount of time, that you can unleash the BFG, Demon Skull, or Ball and Chain. Gauntlet Dark Legacy GBA has no turbo system, thus no cool special effects to kill the 8 enemies. Let’s just say I wasn’t playing the game on my native GBA, so I am not sure if the enemies on screen were lagging. I did see my characters movement speeds vary, so there is probably game slowdown. Sound is directly tied into gameplay for Gauntlet games. The Announcer, ala Sumner in Dark Legacy, is the voice of reason. He tells you important facts such as “Don’t shoot food” and “Use keys to open chests” and “Blue Wizard is about to die”. The game has voice for the character select, but that is it. Once you are in the game, you will never hear the voice again. The worst part of the sound that exists is the background “music” which is more like someone failed to create a midi their first attempt and then ran with it. This is some of the worst background music I have heard; it was like listening to an album getting scratched. Fun Factor: Here is why there is a lack of fun factor with the game: Too few enemies onscreen, “automatic” combat when close is poorly implemented, no Announcer voice and no reason to collect gold? I stopped playing after the first level because it was a chore to go through the game, even with my Gauntlet love. Sumner wasn’t popping up a menu to spend money, so I figure it is useless. The BIGGEST mistake with this game is that it is SINGLE PLAYER ONLY! 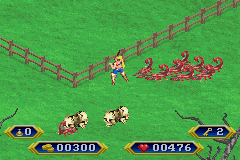 Gauntlet’s “Multiplayer” in this game is the fact that the player has enemies to attack or can switch characters to start a new game. This design choice makes the game alone a failure of the Gauntlet name if I were to check the back of the box. Graphics: Graphics are passable for what I would consider the first generation of GBA games. The designers should have stuck with a top down perspective or done a much better job with the “3D” look of the 2D sprites. The enemies in Gauntlet games have always been low quality, but the look of these enemies make it hard to see what they are. I can see the red scorpions, but the bigger grunt guys don’t look like anything I’ve seen. The fire creatures are downright ugly. Most of the graphics have been based off the existing Dark Legacy for consoles for the Sumner’s Tower hub. The Bottom Line: This is a travesty of the Gauntlet brand name. Here I thought Seven Sorrows was the worst “modern” Gauntlet game, but along comes Midway with a cash-in on GBA by outsourcing to a developer which doesn’t understand the game. No omnipresent narrator ala Sumner, no multiplayer, no turbo, no big enemy spawn, no fun. Any of the other Gauntlet games are more fun, even the old console ones were you could glitch through walls. At least that was entertaining. This game makes me pessimistic for the isometric DS Gauntlet that has been delayed many times. Maybe the designers finally played the GBA version so they could get the formula straight. If Midway were still a viable company with control over the Gauntlet IP, I would be the best game director for the Gauntlet franchise. Listen up whichever company gets the license, I could return the game to the glory of Gauntlet Legends for N64 with updates. If not, I’m going to make a clone of the franchise stealing the best parts of other games. GBA reviews game: A Gauntlet game without multiplayer is a poor choice when I support link cable with up to four players. I can handle isometric games and I can render more than 9 sprites at once. I can have more fun with better games than this Gauntlet. I’m the modern SNES, I deserve better.